What are your Ventilation Demands? When you are constructing or retrofitting your facility, you might be considering different ways to save money on ventilation without sacrificing quality. Compromises can be made on many things. However, if you have an industrial facility, choosing a light-duty louver is not one of them. To meet the building’s intake air demands, and stand-up to the wear and tear of heavy industry, you will need heavy industrial louvers. 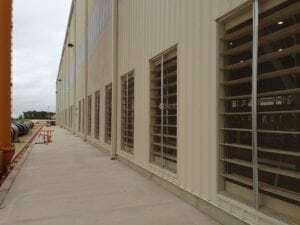 Wall Louvers facilitate positive ventilation throughout your warehouse or factory. They let cool air enter the building through the side wall, and encourage air to move throughout the building. When paired with a natural ventilator, like a Labyrinth, they are part of a gravity ventilation system. There are many types of wall louvers on the market. That’s why it is important to know the difference between industrial and non-industrial louvers like commercial louvers and architectural louvers. It is also important to know that if you are in any industrial, or often even heavy commercial setting, industrial louvers are the only choice. Stronger – Industrial Louvers are much stronger than their commercial counterparts. They are made with a much thicker gauge material such as extruded aluminum or stainless steel. Unlike some commercial louvers an industrial louver is physically durable. It will stand up to the wear and tear of a heavy industrial setting. Larger – Industrial Louvers are generally larger than commercial louvers. They come in all shapes in sizes, but they are generally larger than 5” wide. They also work in conjunction with one another. Dozens of units become placed in a row to essentially create one long wall louver. More Efficient – With the larger size of the unit, and the higher level of airflow required, industrial louvers are often more efficient than non-industrial units. For instance, a Moffitt LV9090 has a much greater free area than a standard, commercial louver. This means superior cooling at the building’s work floor. The Moffitt Advantage – When it comes to industrial louvers, you also have the highest quality products by using Moffitt. With over 55 years of designing, fabricating and installing wall louvers of all shapes and sizes, Moffitt is the answer. Our team can provide the best ventilation systems for your warehouse or factory. They are Pretty – Commercial and architectural louvers look good and not much else. They will look great on the cover of Architectural Digest but they may not be able to deliver when it comes to durability, effectiveness, or efficiency. Industrial Louvers however, can meet those requirements. Even better, with improvements in paint and design technology, they can often be made to meet a building’s aesthetic and architectural requirements as well. If you want a louver that keeps your factory/warehouse cool and productive, choose an industrial louver. At Moffitt Corporation we have been working for over 55 years to create the best products for our customers. From our gravity and intake vents to our daylighting and smoke relief device, we work non-stop to provide the best products. Call us today at 1 (800) 474-3267 to learn more. Our team is on hand to help you find the right intake device for your facility.